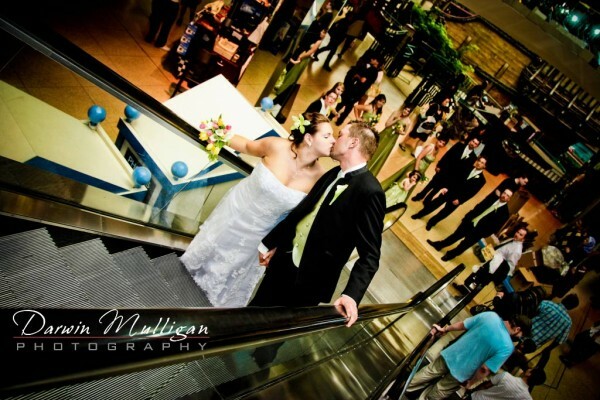 Natasha and Shaun share a romantic kiss on the “up” escalator on their wedding at West Edmonton Mall. This photograph was fun to take, but difficult at the same time. Natasha and Shaun were kissing going “up” the escalator, while I was on the “down” escalator. I had to capture the kiss, and get the bridal party in the background, at the same time – fighting Vertigo from looking through a camera with a wide angle lens. The only thing harder to do is to photograph is on the carousel at West Edmonton Mall Galaxyland looking through a camera with a fisheye lens AFTER you have a large lunch! This is week 28 of my 52 Weeks of Weddings Project. Come back each week to see new wedding photos, some will be in Edmonton and surrounding area, and some weeks will feature a destination wedding.